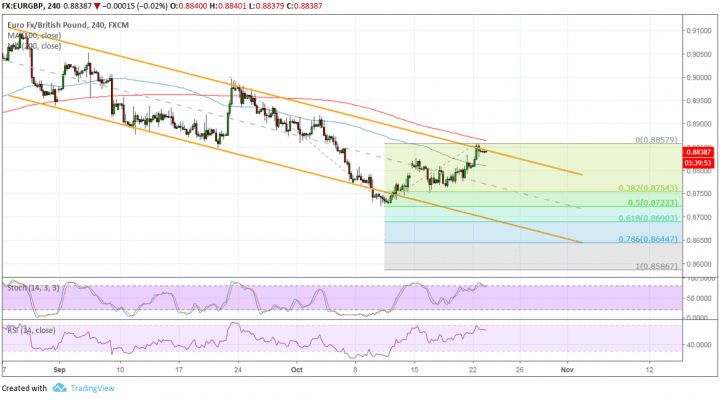 EURGBP might be ready to resume its downtrend as it tests the descending channel resistance visible on its 4-hour time frame. If so, price could aim for the Fib extension levels as downside targets. In particular, the 38.2% level lines up with the mid-channel area of interest, which might be the first take-profit point. The 50% level lines up with the swing low, which might also be a strong support zone. Stronger selling pressure could take EURGBP down to the 61.8% Fib at the .8700 level or the 78.6% level at the channel bottom. The full extension is located near the .8600 major psychological mark. The 100 SMA is below the longer-term 200 SMA to indicate that the path of least resistance is to the downside. This suggests that the downtrend is more likely to carry on than to reverse. In addition, the gap between the moving averages is widening to reflect stronger selling pressure. The 200 SMA is just above the channel resistance to add an extra barrier in case of a pop higher. Stochastic is indicating overbought conditions or that buyers are feeling exhausted. Turning lower could bring selling pressure back in the mix and allow the downtrend to resume. RSI also looks ready to turn south so EURGBP might follow suit as sellers take control. The Brexit situation isn’t looking too good for the pound but the euro isn’t without its woes. After all, the Italian budget drama is still going on as the European Commission requested a formal explanation from the government when it comes to its spending plans. Credit rating agencies have either downgraded ratings or are expected to issue downgrades in the days ahead. Any positive development on the Brexit front, particularly when it comes to the Irish border back stop issue could prove positive for the UK currency. Then again, the euro might steal the show with the ECB decision coming up.